APSWREIS has issued Inter 1st Year Entrance Test 2019 (APSWREIS RJC CET) notification and online applications are inviting from the students who are appearing for SSC exam in March/April , 2019 for into 1st year intermediate MPC, BPC, MEC, HEC and CEC with English as the medium of instruction for the academic year 2019-2020 in the APSWR institution under the control of Andhra Pradesh Social Welfare Residential Educational Institutions Society, APSWREIS. Students who were applied for the RJC CET notification, they can download their hall tickets from the official website. Examination Timings: 11.00 AM to 01.30 PM - (2:30 Hrs). 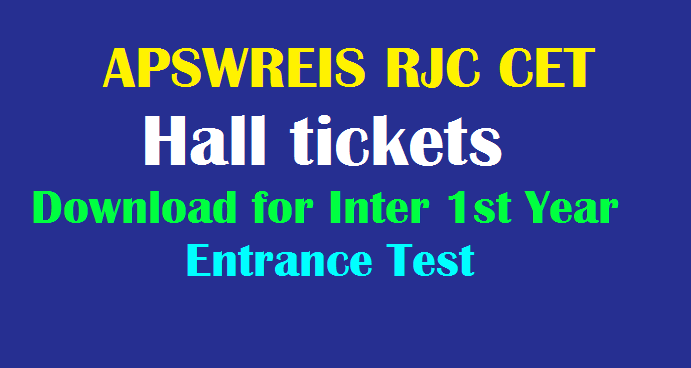 2: Click on the link "Notification For Admission Into 1st Year Intermediate -APSWREIS INTER CET 2019"
4: In this web page click on " Download Hall ticket"